If you’re a fan of the high-protein, deluxe, delicious breakfast, you’ve definitely come to the right place. This is over the top good, and SO filling you’ll probably be able to skip lunch. I calculated the protein content for the breakfast pictured above at around 37 grams. Bennys have always been my splurge breakfast of choice, so I was thrilled that my vegan rendition turned out even better than I imagined it would. 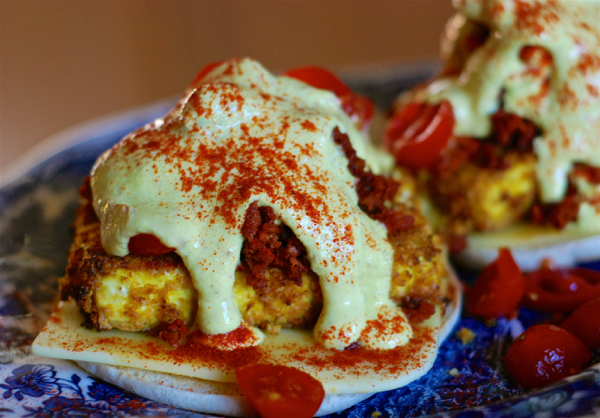 You could easily substitute the chorizo with vegan bacon if you wish. Prepare the hollandaise sauce in advance. Split and lightly toast the bagel thin/English muffin and place it on a plate. Spread a little vegan mayonnaise or mashed avocado on each half and top with slices of vegan cheese. Cut the half block of tofu in half to make two equal sized “cakes.” Rub each with a little vegan mayo. Mix the panko, garlic powder, onion powder, smoked paprika, and turmeric in a shallow bowl. Dredge each tofu cake in the panko. Press gently to make the panko stick. Make sure the cakes are completely covered in crumbs. Air fry at 390 degrees for 6 minutes. Flip, and air fry an additional 4 to 6 minutes or until golden brown. Place cakes on top of the vegan cheese slices, followed by the fried, warm soy chorizo, and the tomato slices. Finally, warm the hollandaise and pour it over the tops of the open-faced benny sandwiches. Salt and pepper, to taste, and add a little smoked paprika if you wish. Place almonds (or cashews) in a bowl and cover with water. Refrigerate overnight. In the morning, remove from bowl and drain well. Place the nuts in the bowl of a blender along with the rest of the ingredients and blend until very smooth. Thin with extra oat milk if needed. Heat the amount of sauce you’ll be using in a saucepan over low heat, whisking constantly. Don’t overheat or your sauce will get clumpy. This sauce will keep for up to 7 days in your refrigerator.